If you are married for the first time and are working on your estate plan, the decisions about where the assets go are usually easy. Most parents in that situation want their entire estate to go to the surviving spouse, and upon the death of the surviving spouse, equally to their children. There may be difficult decisions about who will serve as guardians of the children or trustees over the children’s property, but typically it’s easy to decide where the property will go. 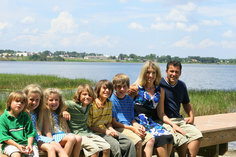 However, in today’s society, there are ever-increasing numbers of blended families. There may be children from several marriages involved, making estate planning more complex. Couples may bring an unequal number of children into the marriage, as well as unequal assets. A spouse may want to ensure that his or her spouse is provided for at death, but may be afraid to leave everything to that spouse out of fear that at the death of the second spouse, that spouse will leave everything to his or her biological children. Planning can also be complicated when a couple gets married and either of them brings very young children into the marriage. The non-biological parent may raise those children, but unless formally adopted, for estate planning purposes, they are not considered the children of the non-biological parent. Therefore, if that parent dies without a will, the children will not inherit from the stepparent. There are many options for estate planning for blended families that will treat everyone fairly. First, it’s imperative that parents of blended families have a will in place. If they don’t, it’s almost inevitable that someone will be treated unfairly. Also, it’s tempting for parents of blended families to create wills in which half of everything is left to the husband’s children and half is left to the wife’s children. However, as explained earlier, this approach can also lead to problems. Moreover, it’s not at all uncommon for a surviving spouse to change his or her will at the death of the first spouse and cut the stepchildren out of the estate plan. There are two options often recommended for blended families when doing estate planning. The first is to use a trust. Under this plan, all family assets are usually held in trust. Upon the death of the first spouse, the surviving spouse has the right to use the assets in the trust for support, with certain limits, such as rights to income or limited use of the trust principal for living expenses. However, the surviving spouse will not be able to change the beneficiaries of the trust, and hence stepchildren could not be disinherited. A second option is for a certain amount of money to be left to children at the death of the first spouse. In that situation, the children will not have to wait for the death of the stepparent in order to inherit. This works well in situations when the children are mature adults and there is sufficient money for the surviving spouse to support herself without relying on the extra funds that are inherited by the children. One way to accomplish this is through a life insurance policy payable to the children. Estate planning with blended families can be complex and each situation is unique. It’s important to keep the lines of communication open and to be aware that it can be a sticky situation for many families. However, with proper planning, many issues that could arise on the death of a stepparent can be avoided completely.